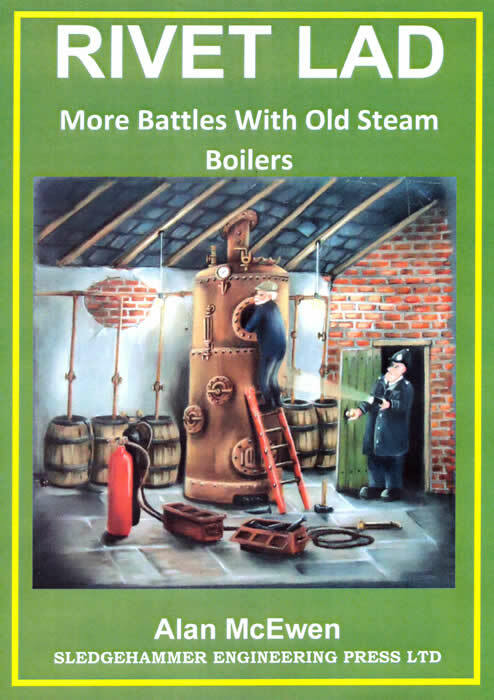 This beautifully produced book is profusely illustrated with over 170 black and white photographs, is A4 size format, hard back and compliments Sledgehammer’s previous volumes titled FRED DIBNAH’S CHIMNEY DROPS and HISTORIC STEAM BOILER EXPLOSIONS. On a Jack Frost freezing cold Sunday morning in December 2003, whilst out rambling with my husband Alan along the cinder towpath of the Leeds and Liverpool Canal in the Weavers’ Triangle, Burnley, Lancashire, taking in the sad, forlorn vistas of the old tumbled-down, grey-stone cotton mills with their countless sightless windows, ruinous stubby chimneys, and with us both firing off shot upon shot with our cameras of the surrounding derelict, but nonetheless, fascinating industrial ruination, I found myself becoming more and more fascinated with Alan’s regular highly descriptive accounts regarding the Lancashire cotton industry, the Leeds and Liverpool Canal, and also the ancillary or, in Alan’s words, the ‘piggy-back’ industries that these now crumbling mill buildings once proudly served. It was this highly atmospherical journey through these canyons of once prestigious Lancashire cotton mills that became the spring-board to one of the most fascinating of past-times I have ever enjoyed. Since that period I have come to thoroughly enjoy our regular forays all over Northern England researching and photographing Britain’s Industrial Heritage, which has, at an alarming rate over the last 20 years, virtually disappeared. During the Christmas holiday of 2004, Alan enthusiastically introduced me to two local sites in East Lancashire where there were what Alan described as being ‘packhorse bridges’. My very first sighting of a packhorse bridge was Higherford Old Bridge at Barrowford which I enjoyed immensely. 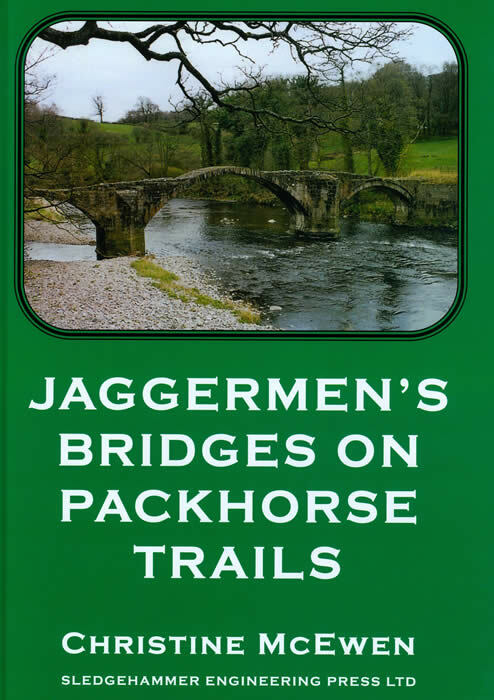 Alan informed me that in certain parts of Lancashire and Yorkshire packhorse bridges were sometimes known as ‘Jaggermen’s bridges’, the name being derived from a breed of packhorses, the ‘Jaeger’ imported from Germany. We then explored the once abandoned eighteenth century weavers’ hamlet of Wycoller, near Colne which boasts a splendid, picturesque, medieval twin-arched stone packhorse bridge. With rising excitement of seeing this bridge, Alan then pointed out another equally fascinating bridge situated a little further upstream. This bridge built of huge slabs of local sandstone is known as a clapper bridge. On walking further upstream and past the beautifully and authentically restored huge Tithe barn set in delightful Pennine surroundings, Alan then showed me the third of Wycoller’s interesting old bridges. This bridge consists of one massively hewn block of Millstone Grit, which is mounted on huge boulders at either end, and spans the moorland-draining beck in one gigantic leap. During the four mile journey back to Cowling I found myself becoming so fascinated with these fabulous little bridges that I made the immediate decision to seek out, to research and to photograph as many other of the old packhorse bridges that Alan said were scattered all over the mountainous areas of Northern England: the Pennines, the North Yorkshire Moors, the Lake District and County Durham. With boundless fascination for my subject I then delved more deeply into researching the specific localities of surviving northern packhorse bridges. I also realised that it would indeed be very worthwhile to visit these bridges, to individually record and photograph these historic, enigmatic, and often beautiful little structures. So in the Spring of 2005, Alan and I commenced with, what some of my friends have described as – ‘a pilgrimage’ – to visit every surviving packhorse bridge in the North of England. A truly massive yet profoundly interesting endeavour! And so it came about during the late spring and early summer of 2005 as a consequence of me seeking out quite a goodly number of locally situated packhorse bridges such as the Donkey Bridge at Oxenhope, Beckfoot Bridge at Bingley and Bronte Bridge at Haworth, the concept of me actually writing a book on packhorse bridges: a sort of illustrated guide and gazetteer of these amazing, historical structures was then put into practice. Within the following few weeks the idea of me writing the packhorse bridge book became a sort of burning ambition, and so I found myself spending most of my free time in gleaning information from books, libraries, industrial museums and of course the internet. Alan with his deep knowledge of industrial history and his intimate knowledge of the Pennines, the Yorkshire Dales, the Lake District and other upland areas of Northern England where packhorse bridges were located, the majority being in wild but fantastically beautiful countryside, was of great assistance to me. During the second half of 2004 I had two articles published in Yorkshire Ridings Magazine and Lancashire Magazine which encouraged me to commence writing this book. Jaggermen’s Bridges On Packhorse Trails chronicles my adventures in searching out and finding packhorse bridges all over Northern England. I do not claim to be an expert on packhorse bridges and any mistakes found herein will be my own, as this is my first attempt at book writing! To research, write, and publish a book new authors have many bridges to cross, and that is exactly what Christine has done with her first publication in which, with boundless enthusiasm for detail and an in-depth feel for the subject, she chronicles her adventures and discoveries whilst researching and recording the now long forgotten and little realised important role played by the packhorse bridges and the Jaggermen’s packhorse trains that passed over them. These bridges and packhorse trains were the motorways and juggernauts of their time, permitting the passage of a myriad of vital and valuable goods from one part of the country to the other, at times providing a lifeline to isolated communities. Now that the motorway age with roaring trucks is upon us these quaint bridges are often overlooked and ignored, their past important role now long forgotten and not understood by the present computer age generation. I know of no other concise publication on this most fascinating subject and it is a credit to Christine that she has taken the time to search out, record and produce such a high quality book. Having read the book I thoroughly enjoyed the journey it takes you on, while at the same time describing the history and constructional detail of each bridge. Without doubt Christine has packed a lot of very interesting and fascinating detail into her first book, and I highly recommend it. This is a third publication from Sledgehammer Engineering Press Ltd and probably the most universally appealing to date, telling, as it does, the story of the transport of goods, materials, minerals and livestock by focusing on the Jaggermen’s Bridges – or ‘Packhorse’ Bridges – of six of the counties that form northern England. Don’t be fooled by the title: whilst it is indeed a meticulous study of the bridges themselves, describing their approximate age, construction and dimensions, as in Alan McEwen’s recently published study of boiler explosions: HISTORIC STEAM BOILER EXPLOSIONS; it is far more than just that. Knitted into the description of each packhorse bridge is a potted history of its locality, the Jaggermen’s route on which it stands, how it came to be built and, often, by whom. We read of the industry that brought about the need for transport in the first place and there is frequently a story of a local tradesman, of craftsmen or a merchant who inhabited the village or the moor. These characterful tales form the real stories within the book with a prominence equal to the descriptions of the aesthetically beautiful stone packhorse bridges themselves. 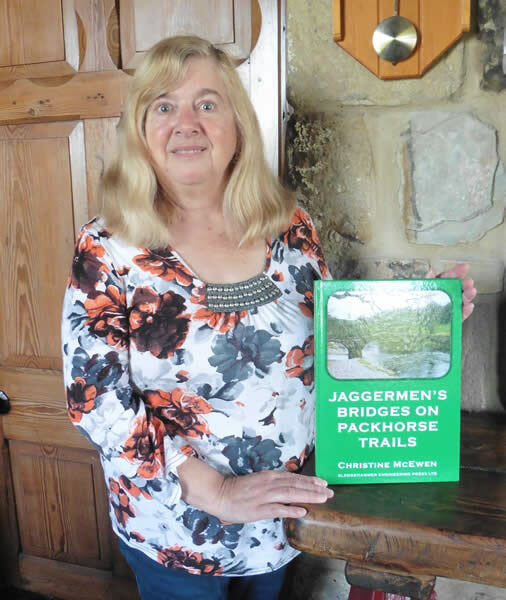 The book’s cover tells us that Christine McEwen is the author, however, there is no doubt whatsoever that Christine, together with husband Alan, enjoyed many happy hours together trekking the countryside with notebooks and maps, searching out and photographing the sometimes shy little bridges. 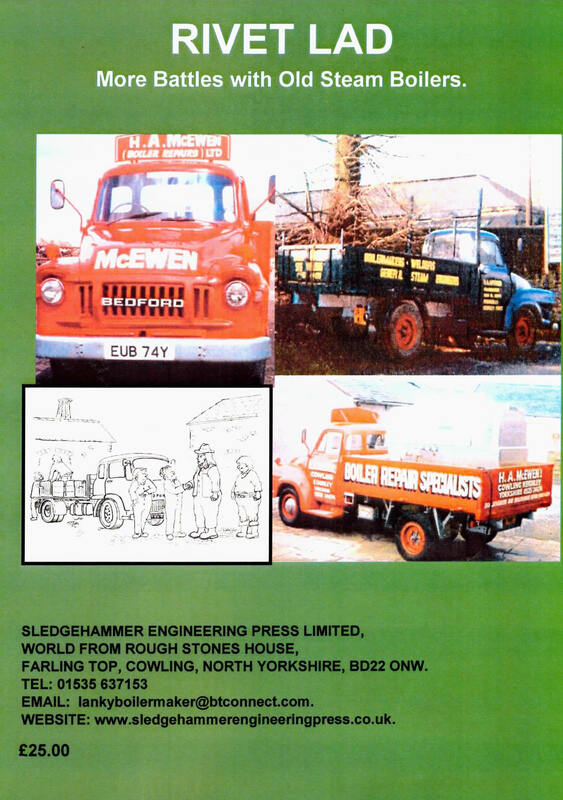 And anyone familiar with Alan’s writing style will be in no doubt that he has had a hand the editing of the book, but it has been Christine’s project from the start and she brings another, much welcomed dimension to the Sledgehammer Engineering Press. This book is a must for all students of social and industrial history and cultural anthropology. It is inspirational in that it may well move the reader to don walking boots and go out and find these little (and not so little!) monuments of historical significance for himself. Whilst you will find no maps, there is however, O.S. references, and careful reading of the text provides all the clues you will need. And artists… take a sketch book! What more delightful subjects could there be? This is Christine McEwen’s first book and the subject is obviously of personal interest. You will have heard of her husband Alan, who since retirement from the boilermaking company, H.A. 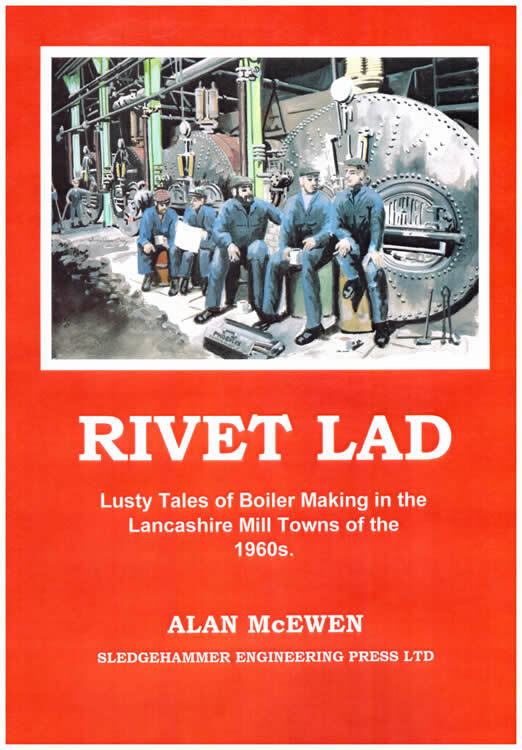 McEWEN (BOILER REPAIRS) LTD, has authored FRED DIBNAH’S CHIMNEY DROPS and HISTORIC STEAM BOILER EXPLOSIONS in the same format. How many times on your travels have you spotted a Packhorse Bridge, noted how quaint it is, and then immediately forgotten about it? The subject doesn’t deserve such dismissiveness for Packhorses were the original carriers of goods. In the mountainous regions of Northern England, Scotland, Wales and South West England’s moorlands, numerous Packhorse Bridges were constructed across streams to allow the Packhorse Trains to deliver their often valuable cargoes. These included snuff, alum (in late Medieval times, perhaps the most important commodity in England); wrought-iron nails, coal, peat, calamine, (for brass manufacture), copper and lead (for roof work at Abbeys, Priories and Manor Houses before domestic use). Christine vowed to take ‘a pilgrimage’ to visit every surviving Packhorse Bridge in the North which she describes as a ‘truly massive yet profoundly interesting endeavour’. Their remoteness just adds to their interest and the large format photographs in the book brings the subject to life. 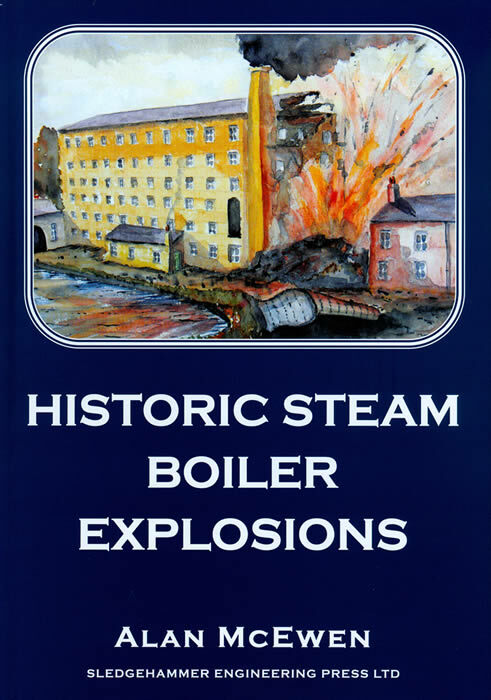 Following on from Alan McEwen’s popular study on HISTORIC STEAM BOILER EXPLOSIONS last year, this fourth publication from SLEDGEHAMMER ENGINEERING PRESS LTD sees his wife Christine pick up the pen to chronicle her adventures in searching out and visiting every surviving packhorse bridge in Northern England. Built specifically to allow loaded horses to pass streams and becks to deliver their essential cargoes, these narrow little bridges date back to the early 17th century and can perhaps be described as the motorways of their age. Often steeply humped and single arched in construction, some were widened in the 19th century to allow for the passing of herds of cattle. 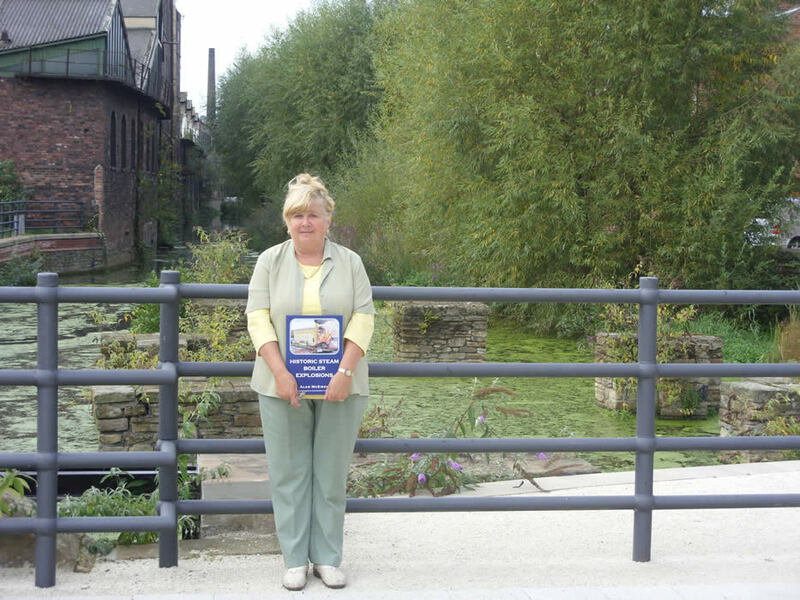 In her introduction, Christine explains how, after first sighting a packhorse bridge at Barrowford, Lancashire, she became fascinated by these seemingly forgotten relics of our past. Over the following pages, which are well-illustrated with superb black & white images, the reasons for her interest become readily apparent. It seems that every one of these charming constructions has its own story to tell, and with the detailed research and light writing style, it seems Christine is the right person to do such material justice. Divided into chapters according to the six counties that make up the north of England, the dimensions and construction techniques of each bridge are also often provided, along with information on the characters, industries and events surrounding it. Credit must go to Christine for uncovering an aspect of our industrial and social history that seems to have passed many scholars by. This really is a lovely book, particularly suited to anyone fond of walking in the northern counties of England, or looking to familiarise themselves with a different side of industrial and social history. Highly Recommended. The Jaggermen were the drivers who led the packhorse trains across the bleak mountainous regions of Northern England. Where the packhorse trains came down from the rocky passes to the many rivers and becks, these water courses had to be crossed by old wooden bridges or ancient fords. During the 17th and 18th centuries, single-arched stone bridges were constructed where the banks were steep. In the Spring of 2005, Christine McEwen set out to visit all the surviving packhorse bridges in the North of England and this book is a chronicle of her endeavours. Not only does it illustrate and describe bridges and crossings across Yorkshire, Lancashire, Durham and Cumbria, but also records the history of the life and times of the Jaggermen and the packhorse trails. A fine tribute to an almost forgotten aspect of our countryside heritage. The subject of this book has received very little attention over the years, and as with a lot of infrastructure bequeathed to us by our forebears, many of these delightful and historically interesting structures have been taken too long for granted, thus allowing them to fall in to disrepair and eventual ruin. 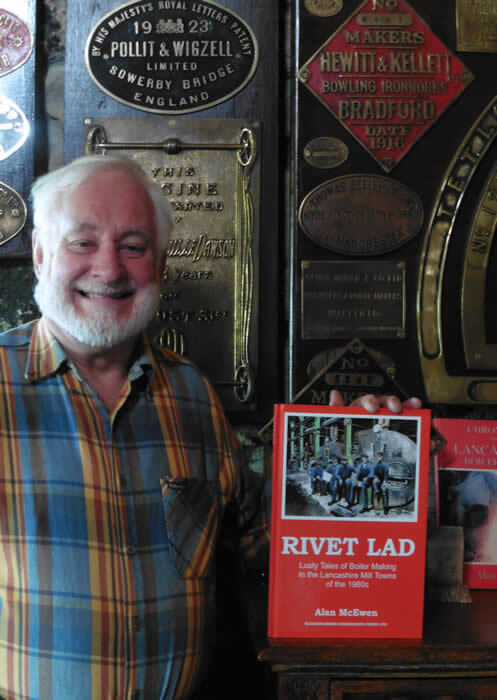 Christine McEwen’s book will go a long way toward making sure that as with the canals, early railways etc, they will not be forgotten and their future a little more secured. As to Christine’s writing style, she has managed to produce a work that could so easily have been a dry academic tome, however, with much passion she has made it a personalised historical tour of a beautiful part of Northern England, whilst stopping off at a number of these interesting structures along the way; at the same time being professional enough to photograph and jot down their specific dimensions etc. for posterity.